Here’s hoping I don’t get a cease-and-desist order for tonight’s video. No monkey business tonight. Terri’s got this one locked up thanks to a nice run at the end of the DJ! round. SPOILER ALERT on that Final clue! 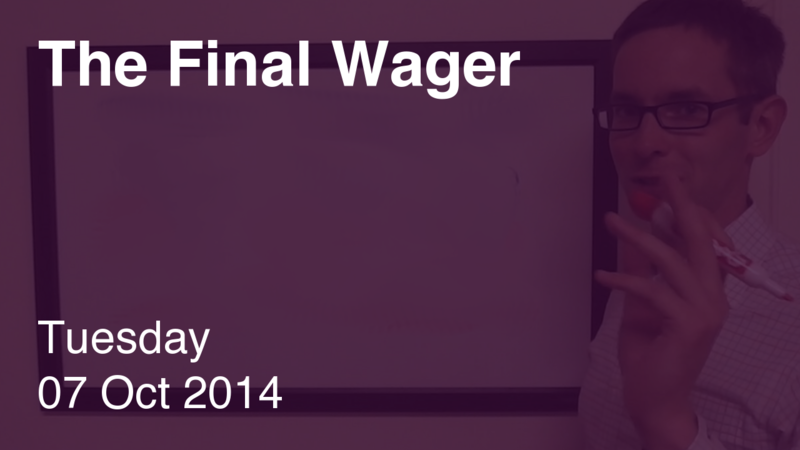 Terri has it locked up, and can wager up to 2,800. Brendan should wager 3,000 to cover Carol. …and should wager at least 1,201 to cover an “unsafe” wager out of Brendan. Both of our challengers go too big, and it costs Brendan $1,000. Carol’s not complaining. I liked Terri’s play today. She’s back tomorrow for Round Three! Ha, yeah… I mean, it’s not like I get mad when they ask about Who Shot J.R.?